When you think of Santa Cruz, odds are it’s image is one of the first you’ll conjure. 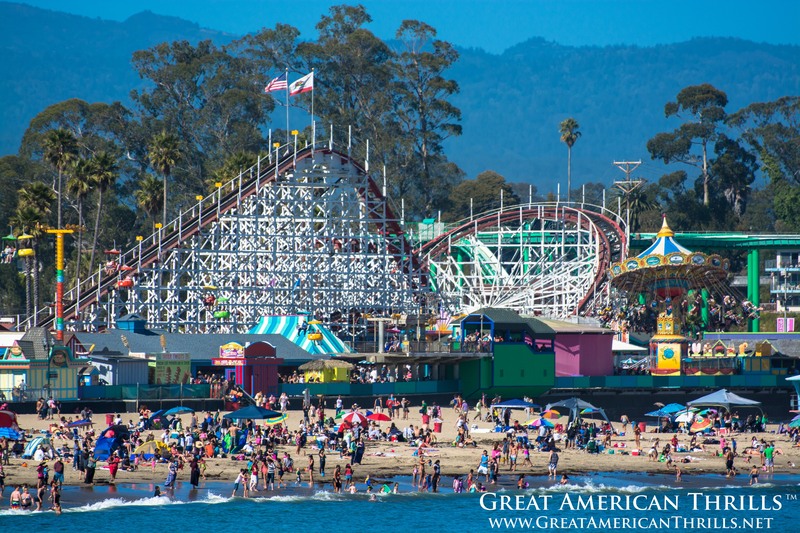 And this weekend, the Grand Old Lady of Santa Cruz will celebrate a milestone birthday. This Saturday, the Giant Dipper join only a small pantheon of rides in the world by turning 90 years old. Now, most people will inevitably say, “Well, if its 90 years old – that wood is all 90, too!” But, that’s simply not the case. The reason wooden coasters seem to last forever, is because they’re constantly being replaced, piece by piece. Odds are, none of the wood on the ride is original to 1924 – but it certainly adds to the mystique. Around half a mile long, and only 70 feet high – the ride is dwarfed by others these days. 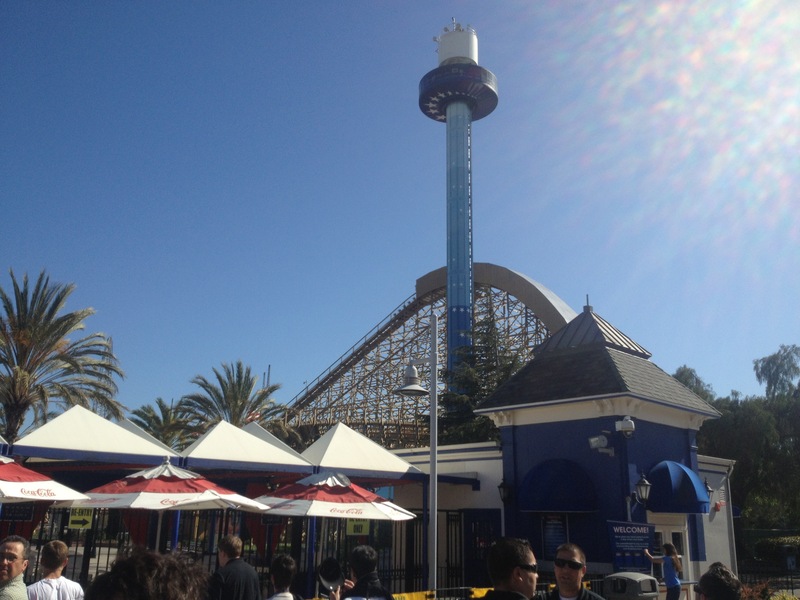 In fact, a “lost park” in San Mateo bested the height of this coaster by ten feet, three years earlier. And yet – something about this ride makes it special. What is that “X” factor? Well, isn’t it obvious? Unlike the modern thrills of today (and nothing against them) but this ride has a soul…old in age, but perennially young at heart. Countless celebrities have ridden the coaster, all with their own unique take on the thrill. Just walking up to the station provides riders with a glimpse back into what made this ride not only a local legend – but an international destination. Featured in many films and countless advertisements, the Giant Dipper is one of only two roller coasters given the honor of National Historic Landmark (The other being the Coney Island Cyclone). Those who have never ridden are always shocked by the kick thei old girl can dish out – and *SPOILER ALERT* that kick starts well before the lift hill! In turning 90, the ride is not only a survivor, it is also a legend. A defiant vestige of times gone by and never to return. So how did this ride survive the Great Depression, two World Wars and thousands of minor (and one major) earthquake? It’s the ownership – the Canfield Family, specifically. They’ve owed the Boardwalk since there was a Boardwalk – and nostalgia has been their best souvenir. I’m glad to be among the ranks that get to enjoy this ride each and every year. There’s not many things that different generations have enjoyed together. Thankfully, the venerable Giant Dipper is one that will continue to thrill millions, for generations to come. After two weeks of soft testing, a lavish grand opening ceremony and over a month of regular operation, the Gold Striker wooden roller coaster at California’s Great America is closed temporarily to allow for additional sound mitigation to be placed on the ride. But don’t hit your panic buttons – published news reports say the ride is expected to be back up and running by the July 4th holiday – NOT an extended, unknown period. According to the City of Santa Clara’s “Smart Permit” website, Gold Striker had several criteria to meet in order for it to open permanently, the biggest of which states: “Should the additional testing reveal that the coaster is not in compliance with Condition 23 (amount of sound coming from the ride) or any applicable City ordinances, Cedar Fair shall undertake Remedial Measures, as defined in the Settlement Agt Agreement.” Apparently, the ride was just shy of making all those criteria. Many industry watchers and local boosters see this addition to the park (and the subsequent work to ensure everyone is satisfied) as a serious commitment from corporate owner Cedar Fair, LP to both the park and the local economy. 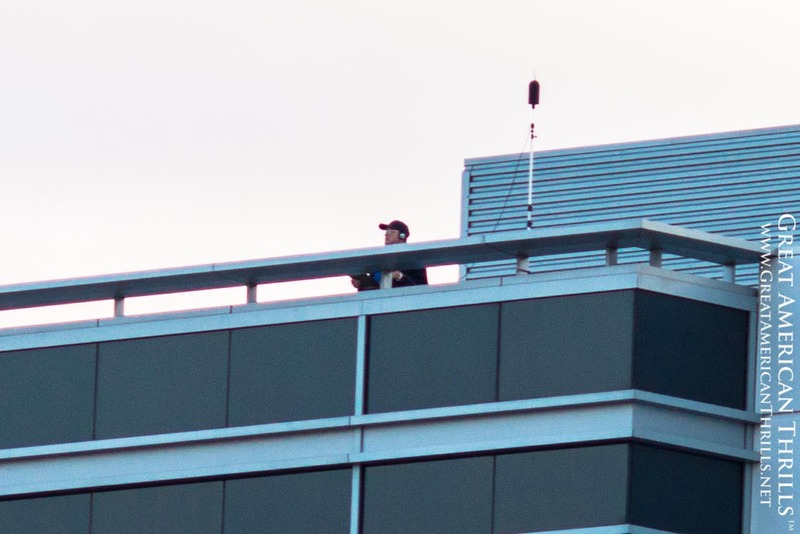 A man with recording equipment and headphones monitors the noise coming from Gold Striker from one of Prudential’s buildings. Since “soft-opening” in May, Gold Striker has seen major additions, most notably the addition of plywood walls and white foam along the sides and underside of the track. By coincidence, these spots pass closest to or face the buildings located on Great America Parkway. During initial construction, the park added what was dubbed an, “initial descent tunnel” onto the first drop of the ride. This feature was presumably added to mitigate the sound from the first drop of the ride. Trying to build this ride has been quite the roller coaster ride in and of itself – the plans go back to 2007, when the park first began the permitting process. 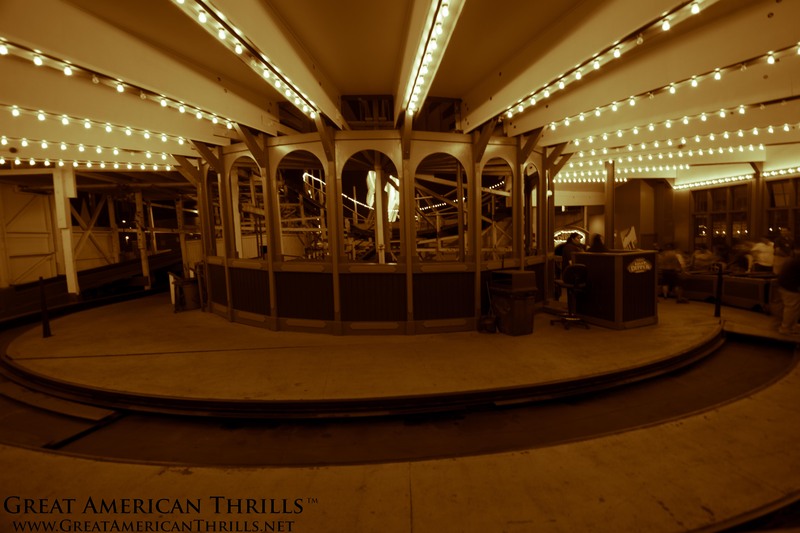 In addition to the standard permits, three hearings were held on potential noise levels – all of which were initiated by appeals from the owners of the buildings closest to the proposed ride. Billy D’Anjou, a local roller coaster enthusiast, has logged 80 circuits on the coaster since it opened in May and is hoping to hit his 100th ride in July. Gold Striker thrills riders on a recent operating day. 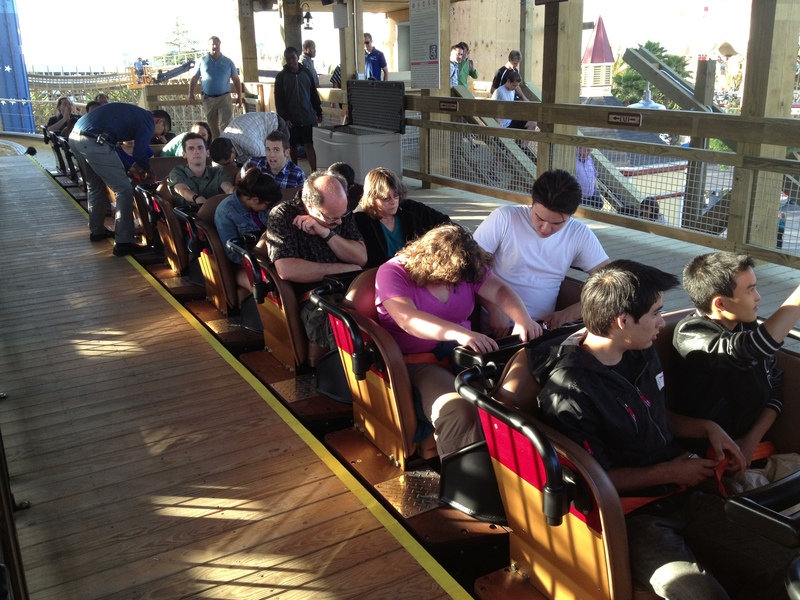 Gold Striker is the first wooden roller coaster built in Northern California since 1999. It boasts the tallest and fastest drop in Northern California and is the largest capital investment in the park in over a decade. The ride was built partially on the footprint of another ride, Willard’s Whizzer – a steel coaster that operated from 1976 to 1988. The land that Prudential’s buildings sit on was originally an auxiliary parking lot for Great America. The land was sold in the late 90’s during the dot com boom. Prudential acquired the buildings in early 2002, according to a press release on their website. Marriott’s Great America opened in 1976, as a celebration of America’s bi-centennial. The concept was to create a chain of parks to become an answer to Disney’s theme park empire. With Gold Striker now officially open to the public at California’s Great America – enjoy this on-ride video of myself and “Lost Parks” Producer, Nicholas Laschkewitsch (who is also the ACE NorCal Asst. Regional Rep) taking in a ride. Yes, it’s official. 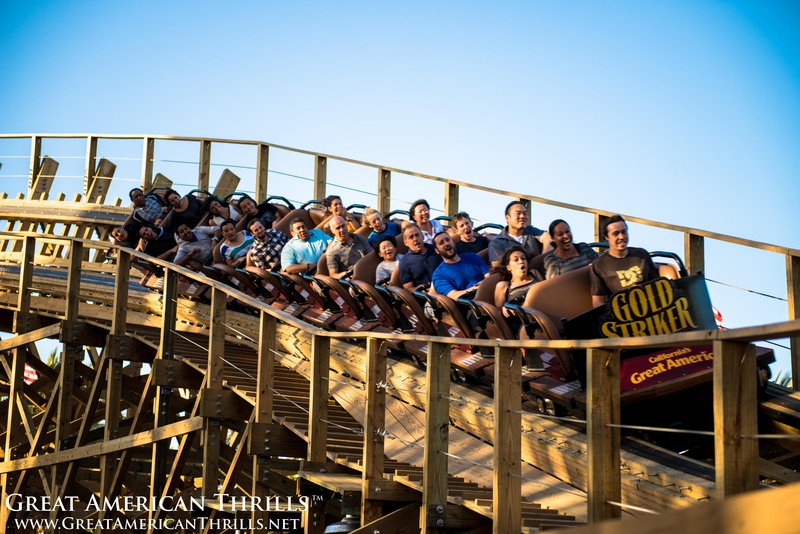 As of this afternoon, the Gold Rush has officially met your adrenaline rush – GOLD STRIKER at California’s Great America is now offically OPEN TO THE PUBLIC! Look for a full media review in the next few days – but for now, get out and enjoy Gold Striker at California’s Great America! Gold Striker is officially open to the public! That’s the word most people were saying after they got off Gold Striker this evening. While not open to the public yet, California’s Great America invited people, including yours truly, to come out and participate in a promo shoot for commercials and still advertising. Gold Striker looms large over Carousel Plaza and the front entrance to the park. Folks, this ride is the REAL DEAL and is setting up to be a real “sleeper hit” across the country. Most people know Great America as a park that seems to enjoy removing rides rather than building them. Gold Striker might just make you forgive them (maybe). The fun starts before you get to the lift hill (that’s right, BEFORE you get to the lift hill!) Folks in the rear seats will appreciate the incredible whip of the turnaround out of the station, which could be the tightest I’ve ever seen taken at speed before on a woodie) and those in the front seat will appreciate the airtime (yes, I said AIRTIME) on the bunny hill before the lift. After ascending the lift, riders enter the “initial descent tunnel” and that’s where all hell breaks loose. The ride is fast, noisy and the effect of blasting out fo the tunnel is impossible to describe. From there the ride does a VERY close flyby of the station stairs, giving wonderful photo / video opportunities. A floater hill and a few head choppers later, the ride finds it’s speed…and keeps it until the brake run. I don’t want to completely ruin the ride for you, but know that there are many “pops” of air on this ride, usually to set you up for another element. Call it a “tag team coaster” because they work perfectly together. Coming into the final turn, you hit the magnetic (it’s Silicon Valley, gotta have some technology) and then back to the station. Pictorium fans will be saddened to learn that two of the entrances have been demolished, but the building itself still stands. “Millennium Flyer” trains harken back to the “Golden Age” of coaster design. The trains are Gold / Red, Red Gold – in 49ers shades. We squeezed in nine (9) rides before the park shut down the line. Average wait times were 15 minutes, shrinking as more and more of the general public left. This ride is NOT EASY to marathon, but for all the RIGHT reasons. It is INTENSE, BREAKNECK PACED and to be quite honest, many of us in attendance were pinching ourselves, wondering how we got this ride to come here in the first place. This is a winner all-around for a park more recently known for REMOVING rides than ADDING them. Be prepared for sharp transitions, “set up” surprises and well-timed elements. The ride is smooth with little attitude. This is not an, “airtime machine” but it has well over 8-10 (I kept losing count) pop airtimes. There are moments when you’re riding only on up-stops. Now, you can take your kids on Grizzly as a warm up and test their (and your) mettle on Gold Striker. In my opinion, this coaster could EASILY take on El Toro in national polls and in many cases it should WIN. The ONLY thing missing from this ride…is YOU!